I am working on posting transcripts for past School Counselor Tweet Chats. A complete schedule and transcripts can be found at bit.ly/scchat_2012. September's #SCCHAT was held on September 4, 2012 at 8pmEST. The topic was Support for First Year School Counselors. Darrell Sampson, @CnslrDarrell, was the moderator. The next School Counselor Tweet Chat is on Tuesday, November 13th, 2012 at 8pmEST. Marci Newman, @ARHSCounselor and her principal will be hosting the chat Principal and School Counselor Relationship. View the 2012 School Counselor Tweet Chat schedule and transcripts here. 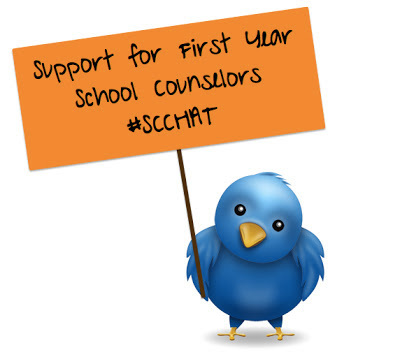 For information on how to participate in a future School Counselor Tweet Chat, click here! Click here for transcripts of the 2011 School Counselor Tweet Chats. School Counselor Tweet Chat is a collaboration between School Counselor Blog and SCOPE. School Counselor Blogger Meet & Greet!